This capstone project offers students the unique opportunity to experience an end-to-end process of a research and design product cycle, while simultaneously working closely with an industry sponsor to improve their existing human interaction technology. My team partnered with BloomBoard to create a suite of tools and experiences that teachers could use to reach both personal and formal professional goals. I am the User Experience Lead on an interdisciplinary team with expertise in design, technology and the social sciences. As of June 2015, we are five months into the process and have completed our user research. Moving forward, we will be in the design and development phase. Due to a non-disclosure agreement with the client, I am unable to share details of our research and design results. Led user experience activities, such as, wireframing, prototyping, user interview, research synthesis sessions, and usability testing. Developed content for written report and process documentation. Our mission is to explore teacher professional and personal learning dynamics in order to build a supportive online video coaching experience in which teachers can seek feedback, receive guidance, and demonstrate substantive growth towards meaningful goals. Methods of recording and sharing videos remain a major hurdle in the coaching experience, so this area requires forward-thinking and innovation on our part. For better understanding how teachers' needs can be supported by video coaching, we have gone through a three-month research process, including literature review, competitive analysis and user research. The research results guided us to ask the right question during user interviews with teachers and coaches. The theme of our literature review develops every week to support our research practice. We attempted to extract characters of teacher coaching experience. Traditional professional development for teachers are not functioning as effectively as it should be because it is intellectually superficial and/or it does not take into account what we know about how teachers learn. Hence, these are what we should attempt to fix by designing one-on-one coaching experience. To understand the current space of teacher development and how technology is used to support them, we performed an extensive competitive analysis. 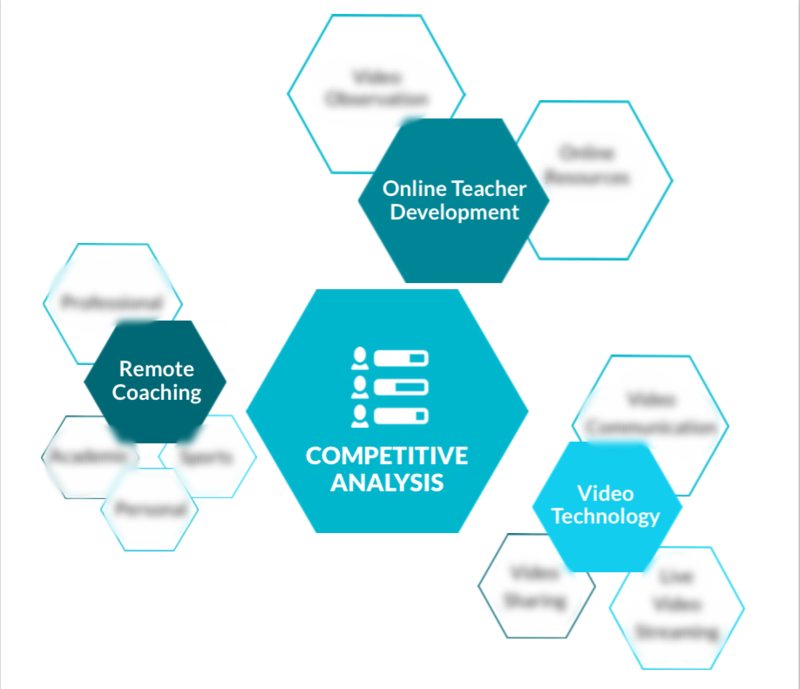 We divided the competitive space into three main areas: video technology, remote coaching, and online teacher development. We found that most of the teacher professional observation companies focus on teacher community feedback, and videos were collected to create local best practices repository from classroom videos. This led us to an emphasis on getting schoolwide buy-in to have enough teachers uploading and reviewing the videos. We conducted 20 face-to-face and remote interviews with teachers and coaches to get a fundamental understanding of teacher professional development, personal learning goals for professional growth, and experiences with coaching. In these interviews, we uncovered the tension between teachers and administrators on professional development, what creates positive professional learning and coaching experiences, and how teachers use coaching to achieve their goals. We also uncovered many of the cultural hurdles, deeply rooted routines and believes, concern for privacy, and many other factors that frequently prevent teachers from utilizing video coaching. As we progressed in our research, we iterated on our field guide, generated new questions and exploring recurring concerns and questions more deeply. Various design and modeling techniques were used to synthesize our interview data into a set of five emergent themes and five key insights. Journey maps were used to understand the process of video coaching expressed in interviews. These maps, along with interview transcripts, were used to understand the cultural aspects and influences between the various stakeholders. 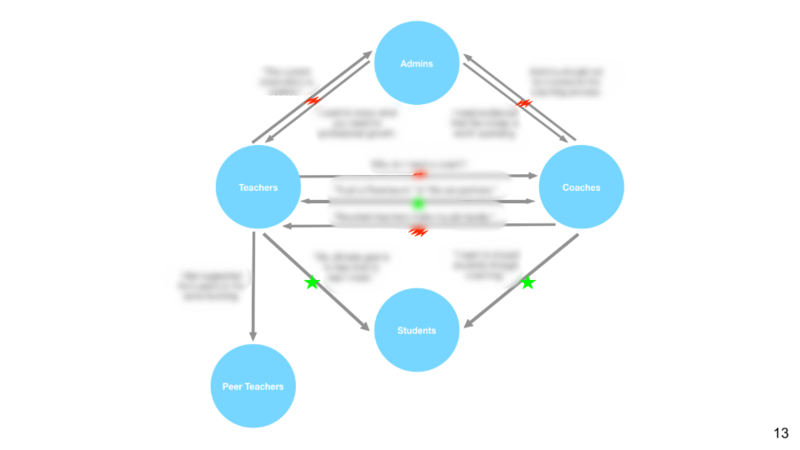 At the same time a flow model was created to understand specific interactions that occur in the teacher’s environment. From these models and maps, we identified several emerging themes which were served as a starting point of our affinity diagramming to group the quotes we collected from the interviews. To identify users’ needs and gain insights from our research, we started with the raw interview data transcribed from our interviews and then extracted key quotes and observations from the interviews. We then clustered all the quotes using affinity diagramming and identified key opportunities and breakdowns in the cultural and flow models. After synthesizing all of the data, we identified 5 emerging themes for further exploration and investigation. Our insights inspired our five design ideas. First, we generated a detailed user experience flow and a slew of design ideas which we believe could help motivate the use of virtual coaching. We tried to create a divergent group of ideas that all focus on some aspect of shooting, sharing, and getting feedback on video. We presented the ideas to teachers and asked for their ratings and feedback on the ideas. Lirio is an ongoing project, with a final deliverable date in August, 2015. Please check back for updates.